The documentary follows The Iroquois Nationals Lacrosse Team on the road as they compete in the 2015 World Box Lacrosse Championships. For the first time ever, the Championship Games were held on an Indian Reservation, in Onondaga in upstate New York, the Capitol of the Iroquois Confederacy. Run Time: 102 mins. 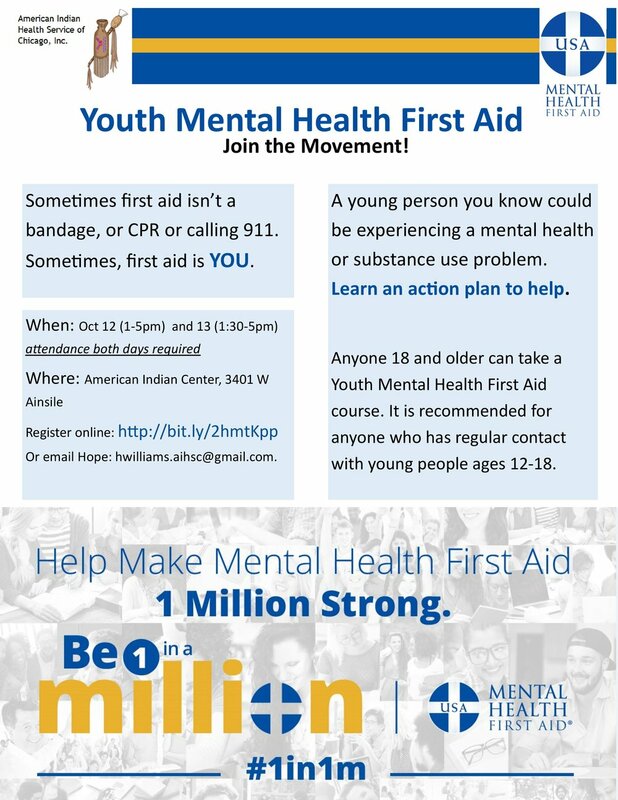 Youth Mental Health First Aid training is for parents, family members and anybody working with youth (age 12-18). Youth Mental Health First Aid is designed to teach parents, family members, caregivers, teachers, school staff, peers, neighbors, health and human services workers, and other caring citizens how to help an adolescent (age 12-18) who is experiencing a mental health or addictions challenge or is in crisis. Youth Mental Health First Aid is primarily designed for adults who regularly interact with young people. The course introduces common mental health challenges for youth, reviews typical adolescent development, and teaches a 5-step action plan for how to help young people in both crisis and non-crisis situations. Topics covered include anxiety, depression, substance use, disorders in which psychosis may occur, disruptive behavior disorders, and eating disorders. Registration is required. This is a two day training and participation on both days is required.